One good thing about growing older is ….. nope, I’m struggling. One thing about growing older is that the physical graft of professional, full-time gardening becomes harder. An obvious insight but one I mention nevertheless as it has become increasingly noticeable during my working day. My back aches more than it used to, my joints do too; I feel the heat more, I feel the cold more; and certain jobs about the garden tire me out more. Take mowing for instance. From early spring to late autumn, Jim and I mow all the grass at The Priory once a week. It takes us the best part of a day and that day’s clippings fill one of the seven large compost bins. 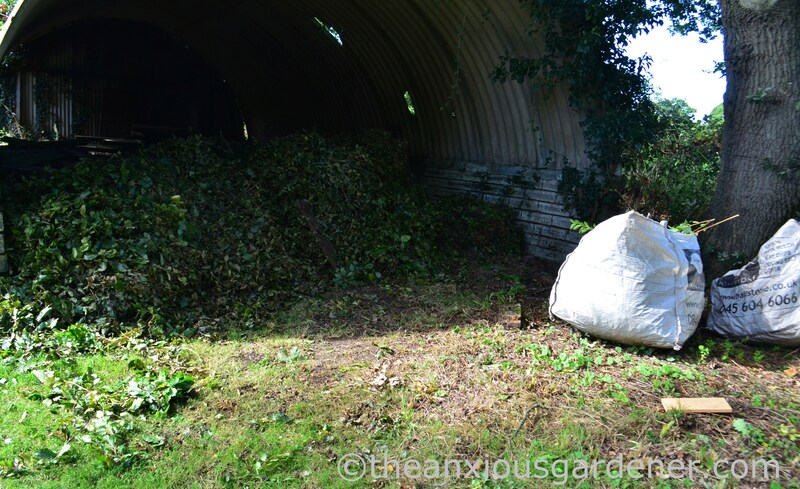 Full bins need regular turning to make space for the following week; and emptying bins this size with a pitch-fork is sweaty work, if a good cardiovascular work-out. In almost ten years, mowing hasn’t become easier. I used to do it all by myself, but halving the work with Jim doesn’t feel like halving the effort. That’s middle age for you. 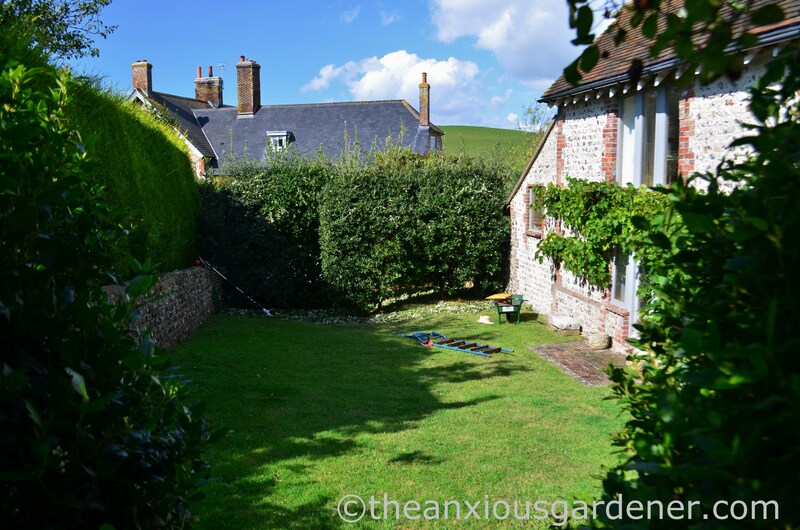 Some years, Sussex summers are hot and dry enough to crisp the lawns and virtually stop growth. Hessian lawns might be unsightly, but any excuse for a pause to mowing is a blessed relief, and I breathe a little, silent whoop of joy. But this year, frequent warm rain encouraged the grass to grow long all summer … right through to the end of November. And I breathed a little, silent boo. Now in December The Priory’s grass needs cutting again but the ground is too wet for the walk-behind mowers or the ride-on. Whoop, whoop. 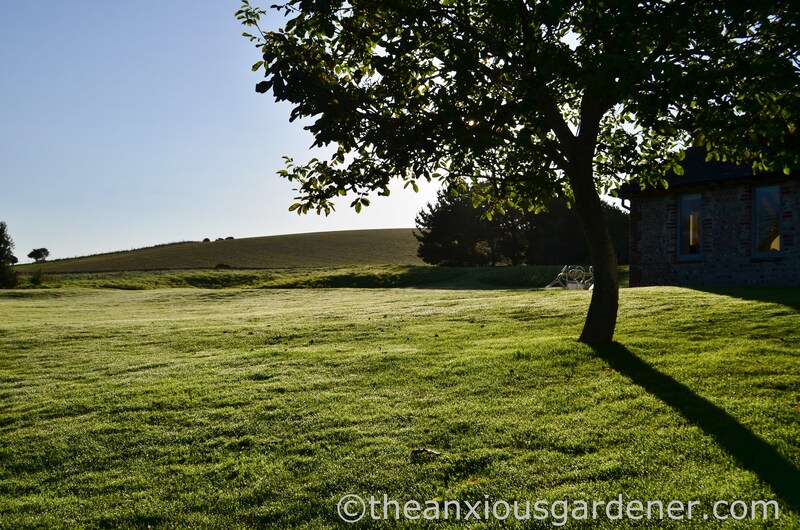 The lawns at The Old Forge have similarly grown enthusiastically but here on thin, free-draining chalk-soil the growth isn’t as rampant; and I’ve had the odd week when I could skip mowing altogether. 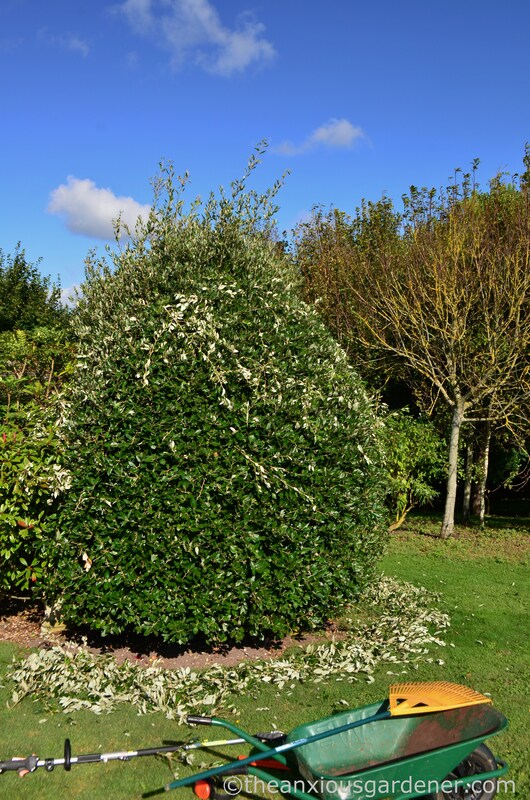 But it’s not as if a break from the mower allows me to put my feet up and file my nails; it simply gives me the chance to tackle other pressing jobs – such as clipping various shrubs like, a few weeks ago, this holm oak. but it’s only one of many shrubs and hedges in need of a trim. 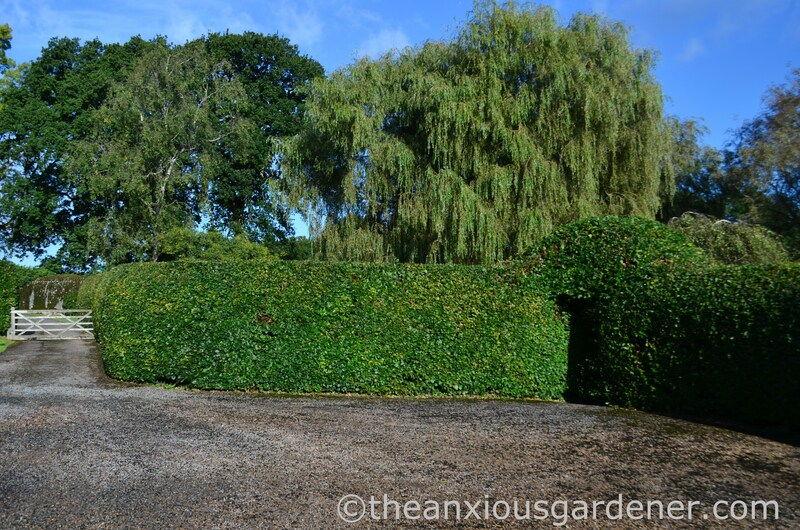 Two lines of overlapping holm oak form a hedge which I also cut; as well as, amongst others, forty yards of mixed hedging. But these are toddler jobs, inconsequential jobs compared to those at The Priory. The really, really, really big cutting jobs in my year are The Priory’s beech hedge and the mixed hedge. 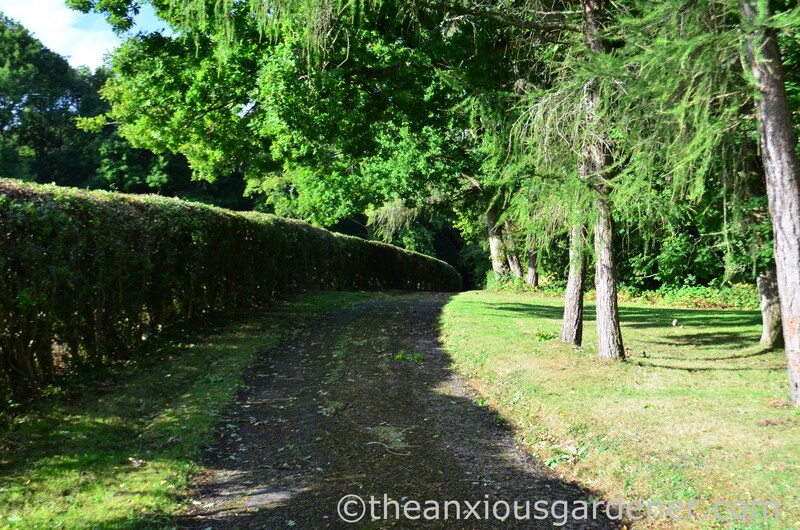 Running alongside the drive, the latter is about three hundred yards long and its annual cut is a task I’ve undertaken since 2011. 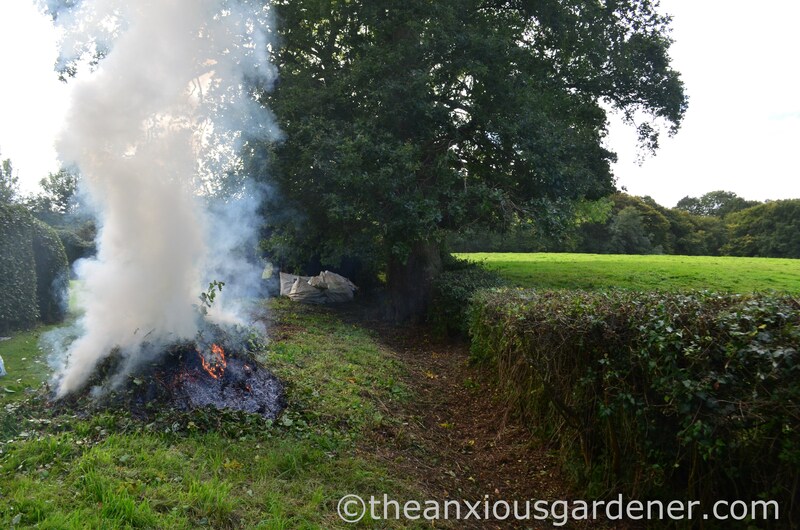 Jim and my friend Nick help but even with three of us – wielding hedge-trimmers, raking and transporting all the cuttings to the bonfire – it’s a solid two-day job; after we’ve completed various other bits of mixed hedging on the estate too. 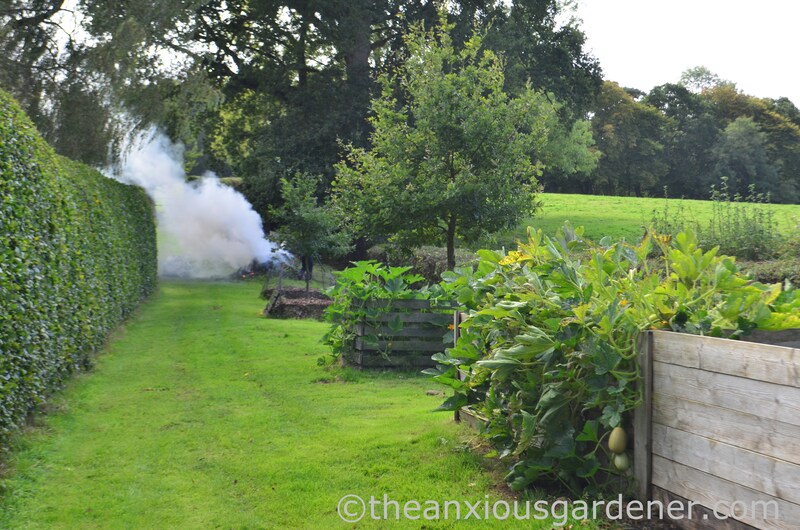 The petrol trimmers are heavy machines and all three of us are wiped out by home-time. Only this year we didn’t cut it. and he did a good, neat job. 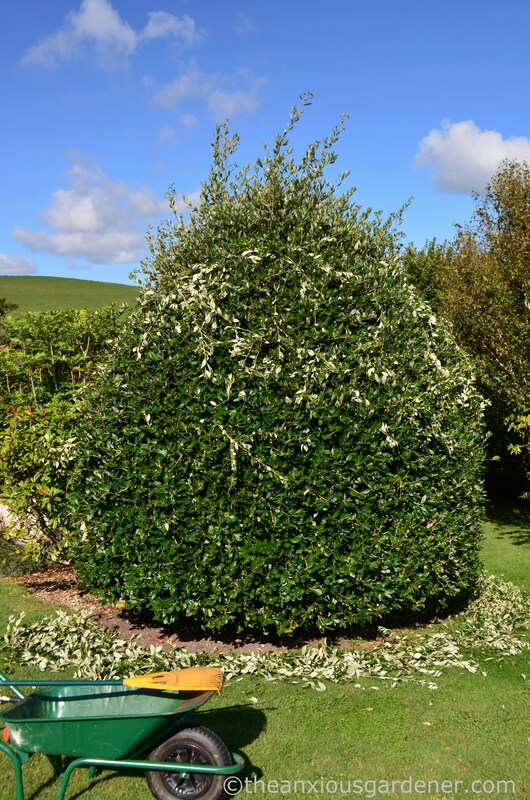 Ben, the contractor, and his brother then moved on to the 2nd mammoth hedge – the beech, which half-encircles the garden. He made a good job of this as well, even if he wasn’t as overly obsessed and fixated on arches and angles as me. I’m quite an overly obsessed and fixated person, you see. I asked him to leave the shoots on the right of the new beech arch as part of its ongoing formation. The arch is almost complete. Every year, I recite, “The arch is almost complete,” like a sad, muttered mantra. But one year, it will be complete. Or almost complete. Having cut these two hedges for so long, not doing so this year seemed wrong somehow and left a hole in my working calendar. They are part and parcel of my job and an annual event when, for a few days, every other task in the garden is set aside; with a very satisfying, slap-on-the-back, final result. So why did I hire a contractor? Vibration white finger is why, also known as hand-arm vibration syndrome. Over the past year, the occasional tingling and numbness I’ve felt in my fingers after using power machinery has become constant in my left hand, quietly noticeable whilst reading, watching telly or driving. There’s really no need for condolences, chocolates or flowers, though it’s kind of you to offer. My fingers are rarely painful and the condition’s intensity ebbs and flows. Often, I’m barely aware of it. There isn’t much I can do about it other than limit the time I spend using petrol power tools to prevent it becoming worse. With new, non-vibrating battery technology, VWF will hopefully cease to be a problem for gardeners and ground-workers. I can’t give up using all the tools in my arsenal, of course, however tingly my hand. 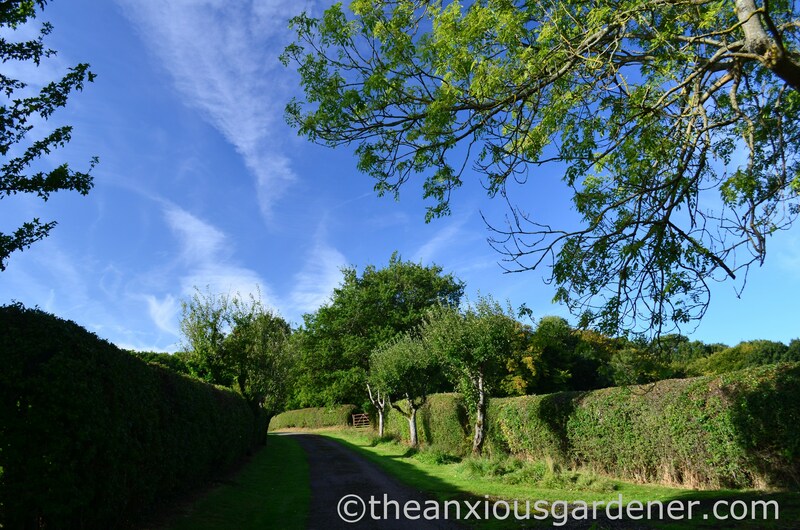 But I have learnt to limit my use of the chain-saw, the strimmer and hedge-cutters to forty-five minutes a day. Which explains why I hired a contractor for the very long, labour intensive mixed and beech hedges. 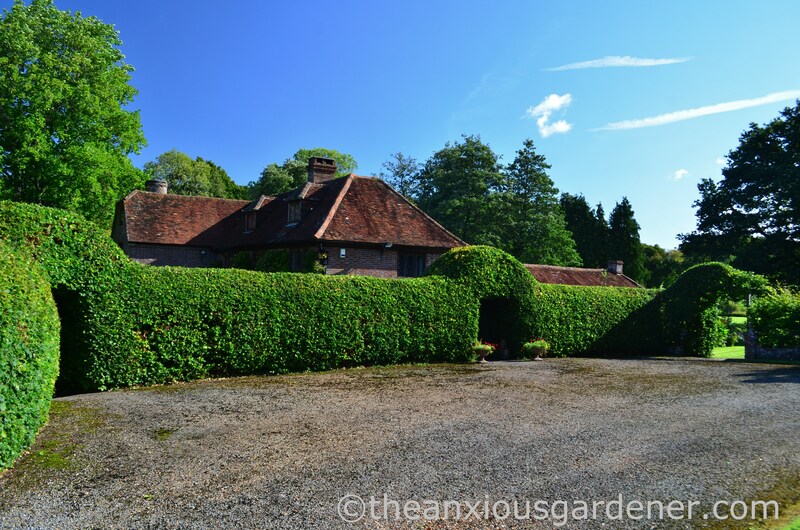 I still do some hedge-cutting: the small ones, like those at The Old Forge and this yew hedge at The Priory. But these are relative tiddlers and are done and dusted within an hour, keeping the vibration to a minimum. Autumn is peak strimming season and most days, I use the strimmer to clear away old, long grass – if only in those 45 minute bursts. And, unlike last year, I haven’t strimmed a single wasp nest … which made me extraordinarily happy. As Ben cut The Priory hedges he piled the off-cuts in an old nissan hut, keeping them bone dry for when Jim and I could light a bonfire. There was so much waste that it took us two days, on and off, to burn it all. So, I was a small cog in cutting The Priory’s hedging after all – if only in a peripheral, non-vibrating kind of way. 45 minutes is still a long time to hold a heavy, vibrating machine. You must have accumulated many strong muscles over the years. 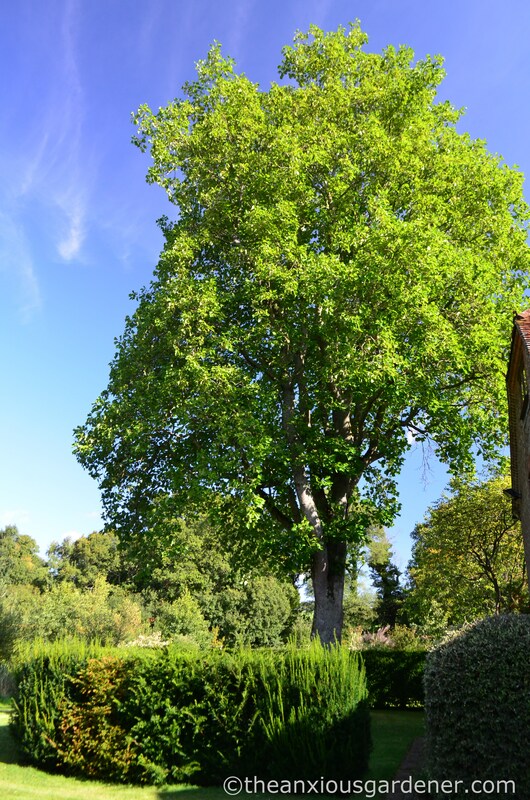 I’ve not knowingly seen a shaped Holm Oak before – only ones growing as rather raggedy trees. Sadly, the muscles come and go, Lucy but yeah, gardening keeps me fit. Holm oak makes for a very good, evergreen hedge and is tough as my old boots. Handsome too, I think and doesn’t mind clipping.. Thanks for the warning. This summer I noticed the tingling and numbness after any serious strimming but didn’t suspect it could turn into a more serious problem. I’ll be much more careful next year. I’ve heard that aging can do those things. Personally I’ve always sheltered behind laziness, but even then the back can get a little sore when the most desperate jobs are tackled. Laziness is a stout shield, Frank but not infallible. I once put my shoulder out reaching for a mug of coffee. Sigh. My sympathies, David. As Christina said “age comes to us all” – but I dont like it. It does seem to get harder as we get older, although I was never particularly resilient physically, even when I was young. I try always to use my battery powered hedge trimmer now. It’s lighter and quieter, and the battery will generally last a morning – recharge over lunch (you and the battery) and it’s ready to go in the afternoon. Perhaps best of all, you don’t spend your working day breathing in fumes. I had to give up useing petrol hedge cutters due to problems with the shoulders and carpal tunnel. Many thanks for sharing David…seasonal good wishes to you and Jim…his artful representation of Aberdeen House is nicely housed in Coldingham…Scottish Borders…my invitation to have house to youselves is still open…trains to Berwick upon Tweed … frequent from Kings Cross.. Interesting post and it all looks very daunting to me! I’m not a gardener, so therefore, I feel compelled to offer advice. My dad switched to no-turn composting, to save his back, and aerates it with various tricks – – tossing in branches, to create air pockets, a couple of sections of perforated plastic drainage pipe, etc. He still seems to be cursing when he shovels it into his wheelbarrow (I stay away before I get dragooned into helping), but perhaps a bit less profanity than usual. Although he could just be more winded. 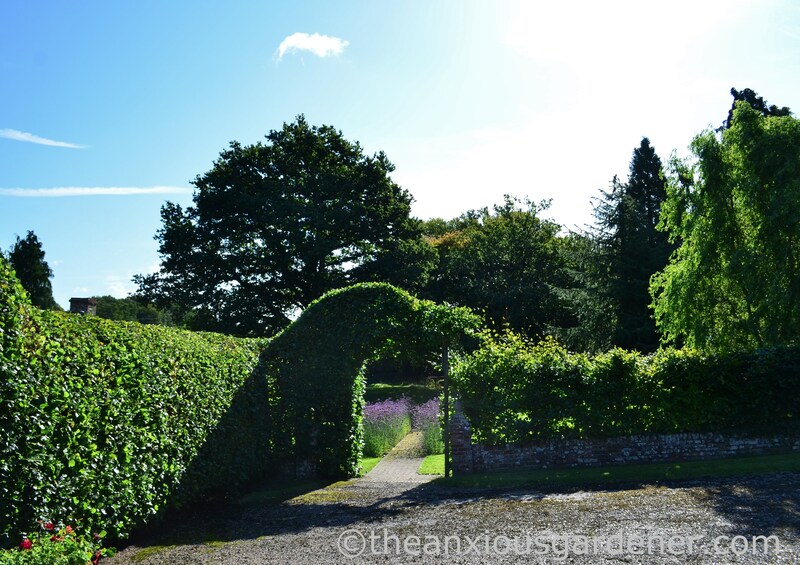 The arched openings in the hedge look great, really neat. Buy some sheep for the lawn, and sell the compost. Use border collies to herd the sheep. Lots of great images from you David, thanks for sharing! I’m sorry to hear about the VWF, I hope it doesn’t get in the way too much. It sounds like hiring that contractor was a smart move, as that’s a lot of hedge to tackle. My only thought is, what about the contractor’s VWF??!! I so know how you feel. 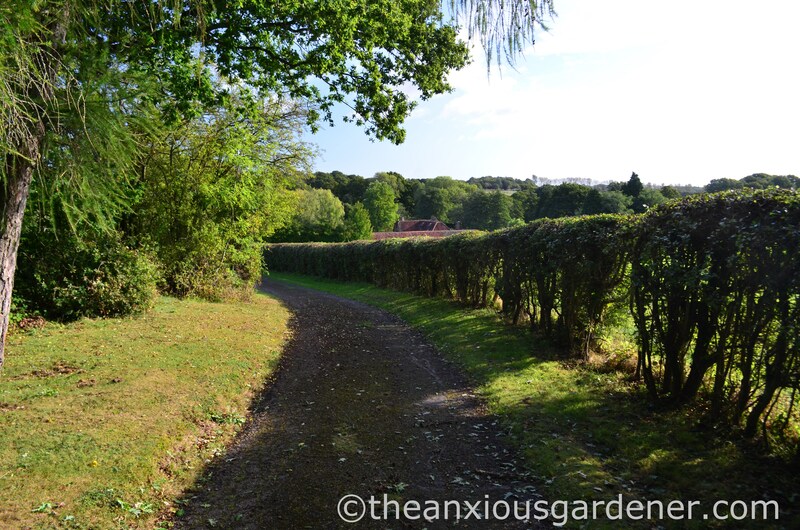 Our French meadow in 2015 and 2016 was a challenge with brambles over 6 foot high and the future veggie garden the same. All ok, machete wielding did the trick in Medieval war style. This year it was grass cutting. Doesn’t it grow fast. I only have a hand mower and this year, diagnosed with a lower back problem, suddenly this one day job extended to three days and I cant move for days after. The hot summer takes its toll quicker too and this year I ended up in hospital with heat stroke – and it takes ages to recover. 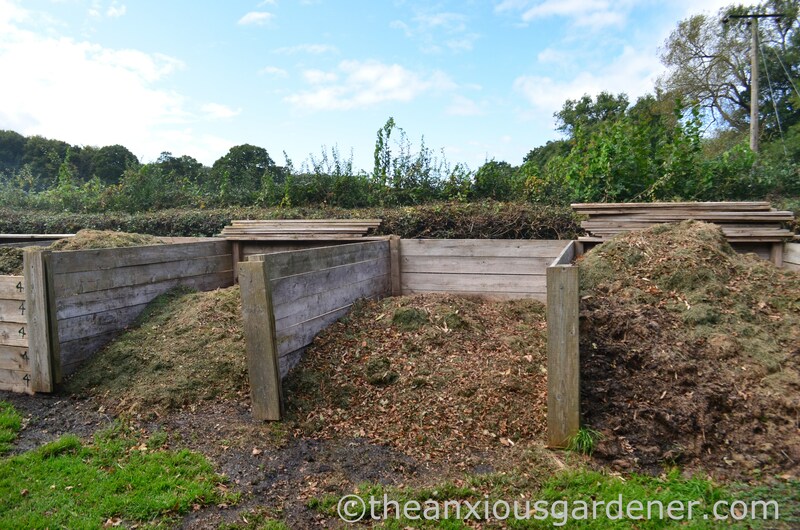 We have seriously had to re-design the gardens, more gravel, raised beds and reduce the grass. Planting has gone from swathes of wild flowers, to wildflowers in pots and containers. Old age for gardening has crept up rather quickly. Your white finger issue sounds unpleasant. I bought a strimmer last year, but it was so noisy, I couldn’t use it. So back to hand shears. 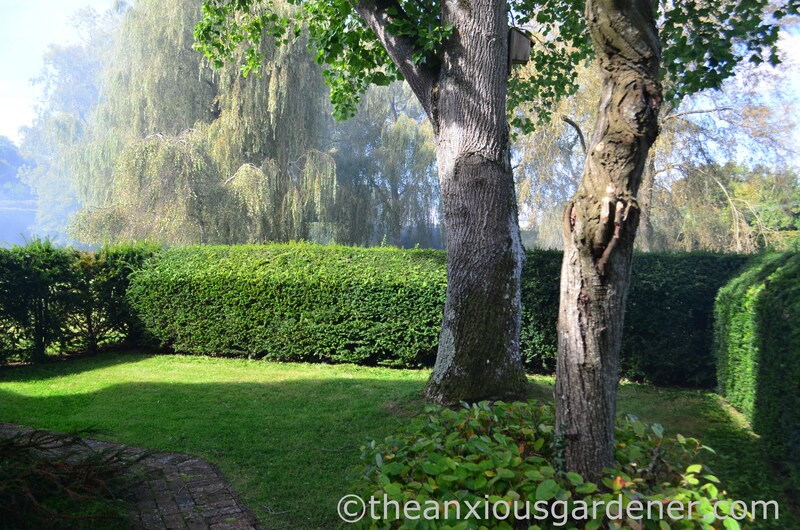 I adore gardening, but we always seem to gain these gardens when we are getting long in the tooth. Getting help makes sense. 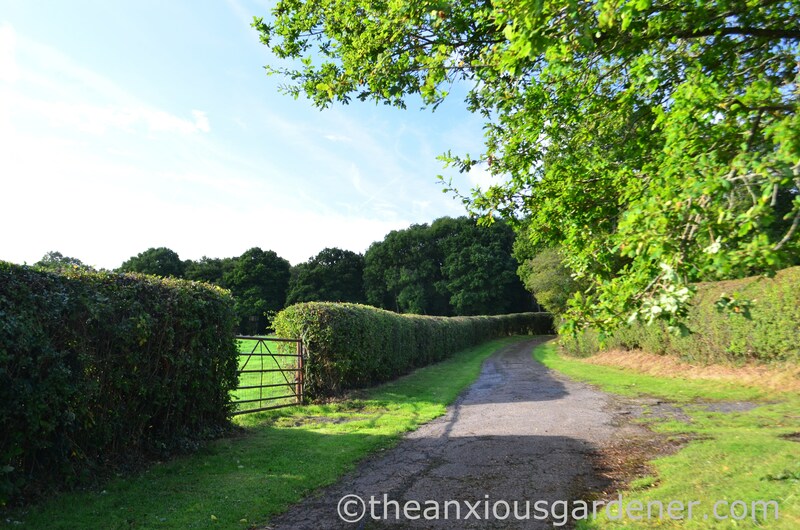 This year I let our farmer cut the road grassways and the hedge – he just refused to see me struggling. Great photos too. A very sensible option I think. I made the choice not to do any machine hedge trimming or strimming early on. Having already had frost nip in my fingers, I knew it would only be a matter of time before I’d have issues. I hope you’re finding a bit of time to work on your own new garden. Hi! I get the tingly hand thing too, I do ulnar nerve glide exercises and this is helping me http://www.nehand.com/Portals/2036/ULNAR%20NERVE%20GLIDING%20EXERCISES.pdf Beautiful photos, lovely post! I have thought about battery powered tools but to replace all those at The Priory would be eye-wateringly expensive and as you know, I have plans afoot which doesn’t make a huge investment at this time credible. Also, the technology is changing and improving, so I have been biding my time. They are certainly something I would buy in the future. Jim recently bought a battery hedge trimmer for a client and raves how quiet and easy to use it is. Funnily enough, I’ve been offered some to review on the blog. Were I a little brighter I would have bitten off their hand. I’m a bit averse to writing reveiws but for no good reason. Beautiful pictures. Funny commentary. Loved it. I got tired just reading about all the work your job entails! Ever thought of using a mulching mower? But then there wouldn’t be all that great compost, I suppose. I’ve had to cut back on a lot of garden work, I simply don’t have the stamina for it anymore, alas. It is hard to face the limitations of aging when we want to power through like we did decades ago! Sorry to hear about your problem, contractors seem a great option. As for the rest, age comes to us all. Sorry to hear about the VWF David. 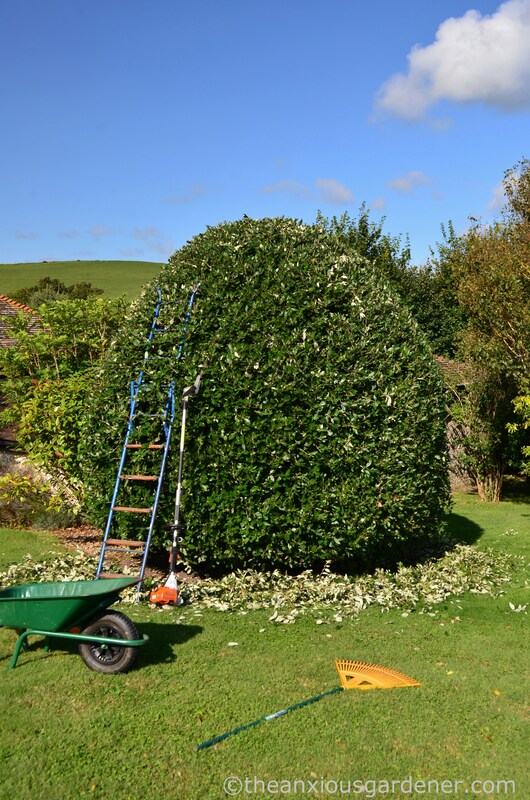 But the contracting out of the hedge trimming sounds like a good move, just a shame we only do these things once we are backed into a corner. 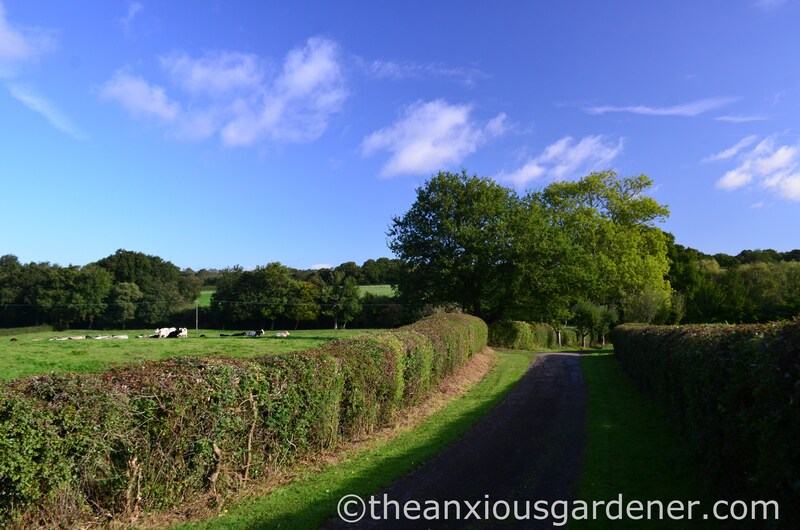 Hedges and lawns are such a pain in the bum … but they don’t half make for good photos. Have a good Christmas, both of you.